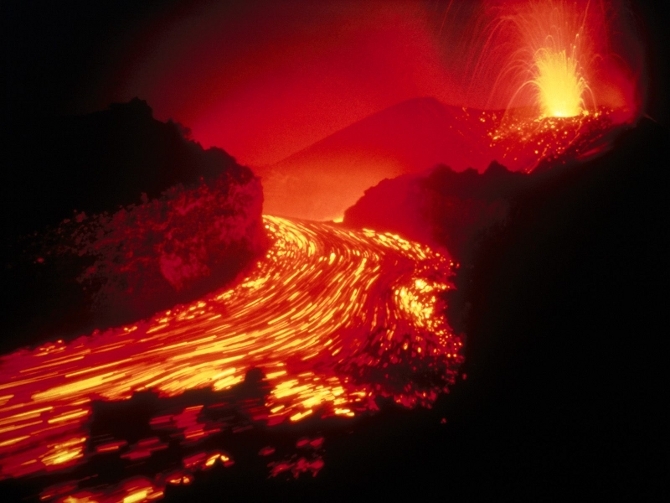 Where does magma gather in the earth's crust? And for how long? With worldwide poverty in decline, plentiful food thanks to science, and life expectancies increasing each year, we can turn to more remote worries - and learn some new things in the process. Like about volcanic eruptions and magma. After studying layers of pumice visible in road cuts and other outcrops in the Taupo Volcanic Zone of New Zealand, where some of the biggest eruptions of the last 2 million years occurred, and measuring the amount of crystals in the samples and using thermodynamic models, researchers have determined that magma moved closer to the surface with each successive eruption. That's a good bellwether, since there seven in just a period between 350,000 and 240,000 years ago. What's more, the dynamic nature of the Taupo Volcanic Zone's crust made it more likely for the magma to erupt than be stored in the crust. The more frequent, smaller eruptions, which each produced 50 to 150 cubic kilometers of magma, likely prevented a supereruption. That's good. Supereruptions produce more than 450 cubic kilometers of magma and they affect the earth's climate for years following the eruption. "You have magma sitting there that's crystal-poor, melt-rich for few decades, maybe 100 years, and then it erupts," says Vanderbilt University volcanologist Guilherme Gualda. "Then another magma body is established, but we don't know how gradually that body assembles. It's a period in which you're increasing the amount of melt in the crust." The question that remains is how long it look for these crystal-rich magma bodies to assemble between eruptions. It could be thousands of years, Gualda said, but he believes it's shorter than that.